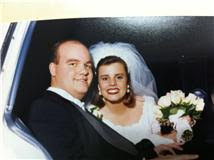 February 28, 1998 was a big day in the life of the Shows/Weathers families. Jason and I married on this day 13 years ago. I have blogged before on how special that day was and I certainly could write again about it, but instead I have decided to blog about the distraction I had on THIS February 28, 2011. Say hello to my distraction...Allyson Laine Weathers! At 5:00 a.m., sweet Ally woke me burning hot with fever. 103 to be exact. I was so puzzled because she was feeling great over the weekend as we celebrated her birthday with yet another party. :) I decided to take her in first thing this morning to see what we might be dealing with as I suspected with such a high fever, we might have the flu. I was right. Type A flu. And yes, we had the flu shot. All of us. So, tamiflu for Ally and the rest of us will start it if needed. "No, I can't go to the ballgame. I sick. I do love the Eagles. G will be there. (pause) I know. (pause) My daddy can't go. He in heaven. (pause) See you later. Bye." Now wait...Before you get sad for me, know I wasn't sad when I heard her say this, but rather I was laughing. Ally talks about her daddy everyday so this wasn't anything new and honestly if you could have seen the reaction of the nice people in the waiting room, you'd be laughing as well. The stares began. The quiet whispers as well. After a few minutes of Ally's conversation a sweet lady sitting near me said, "did she just say her daddy was in heaven?" I politely told the lady that her daddy had died of leukemia when she was 5 months old. Honestly, I felt sorry for all in the waiting room that heard her because for us we talk of Jason's life and death daily, but some people are not used to hearing a 3 year old talk about such a heavy subject. Right after this conversation, Ally says to me, "I want to do my cheer leading." I immediately grabbed my phone so that I could video this routine. At this point, I was laughing so hard. Ally Weathers has been a great distraction since her birth, but I was super thankful for yet another funny distraction provided by Ally on this day especially. :) God is good like that! Lots of sweet memories today of what took place 13 years ago. I am super thankful that God allowed me to be the wife of Jon Jason Weathers. Thankful for the grace of our Lord that is ALWAYS enough...especially on significant days such as this one. This morning as I was scrolling through facebook on my phone, a sweet sister in Christ had posted a youtube video of the song "Jesus, Draw Me Ever Nearer" by Kristyn and Keith Getty. It was a most busy morning in our house, but for some reason I was drawn to watch it. As I stood in my bathroom while trying to put make-up on for the day, I wept as I listened to the song. Click http://www.youtube.com/watch?v=80s6fWli-Rc to listen. This is most definitely my hearts cry...certainly I didn't pen these words, though I felt as if whomever did had read my heart. I have failed miserably in so many areas since Jason's death, but my desire has been to honor Christ in all areas of my life, especially in my grieving. He has called me to this "passage" and I am worn from the journey, BUT my longing is that when this "testing" is complete that I would look more and more like Jesus than before it began. And when "midnight meets the morning, let me love You even more." His word promises that morning will come...Psalm 30:5 says, "Weeping may remain for a night, but rejoicing comes in the morning!" The hope that I have is in Christ! How I do love Him so, but want to love Him even more. Happy 3rd Birthday, Allyson Laine Weathers! Friday, February 22, 2008, my sister in law, Ashley, drove me to see Dr. Gillespie for my weekly check-up. I went to this appointment with the intent of persuading my sweet doc into letting me have baby Ally that day. Her due date was February 29, 2008. (Funny she was due on leap year! Little did we know what a year this 2008 would really be!) My bags were packed and everyone was on stand-by, including a VERY weak Jason. You see, Jason had finally been released from the hospital after an almost 7 week stay the Sunday before she was born. M.D. Anderson had called on Thursday, February 21, to schedule a consultation visit with Jason for March 2nd. I had just a small window of opportunity to have a baby in all of this craziness! I told Dr. Gillespie of my predicament and his answer was, "let's go have a baby TODAY!" Yea! I walked into the lobby where Ashley waited for me and said, "Ash, we're having a baby today!" Labor Room 7 was where I was assigned. Seven...a perfect number. Ashley and I called all of the family to tell them I had been admitted. Mrs. Peggy, Jason's mom, was in charge of getting Jason to the hospital at the appropriate time. I had prayed SO fervently that Jason would be able to be there when Ally was born. (Many of you prayed with me in this regard!) God was so faithful. Labor lasted most of the day, but finally later in the afternoon things began to progress quickly and my mom called Mrs. Peggy to tell her to bring Jason, IF he felt up to it. I wasn't certain he was physically able to be there, but exactly one hour before her birth my sweet Jason walked into Labor Room 7. I was elated and overwhelmed with emotion that he was there! Ally could come. And she did. She was perfect. She weighed 7lbs and 7oz. Seven...a perfect number! Jason was the only one to hold her after her birth besides me. No one would dare ask him to hold her. He just held her and stared at her perfect little face that strangely enough looked just like him and still does! Jason had a little over 2 weeks with Ally before he had to go back into the hospital for more chemo besides a quick 2 day trip to M.D. Anderson. He soaked up as much Ally time as he could. She was just what we all needed. A little bit of JOY. So, Happy Birthday, baby Ally! Thank you for being a picture of God's love for us. I pray you will grow to love our Savior and walk the path of righteousness all the days of your life. I pray you will seek Him in all you do. I pray you will have a deep love for God's word. I pray you would have compassion and show love for others the way Jesus does. I pray you would be content with whatever circumstances come you way. I pray you would love the church as Christ does. I pray you will be gentle in spirit. I pray that you will always have a heart full of gratitude. I pray you would be a woman of great integrity and humility. I pray that your lips will ever praise Him. I pray that you never turn your back on the ONE who died so that we might LIVE! For by trusting in Jesus ensures that one day you will be united with our Savior in heaven and reunited with your sweet daddy. This is a reunion I don't want to miss! Ally Weathers is definitely a picture of God's faithfulness and love for us! I do wish I could be more consistent when it comes to writing on this blog, but for many reasons it just doesn't happen. Tonight, however, I feel like writing. I pray that just maybe someone reading can relate to what I am going to share. God is still teaching me so much in this season of my life. I can't believe that it has been 3 years since Jason's diagnosis with leukemia. January 7, 2008, is a day I think will forever be etched in my memory. It is so strange how a date on the calendar plays such a huge role in the grieving process. Thankfully, this January 7 came without a whole lot of dread, but once I realized what the date was, I felt overwhelmed with sadness and emotion. However, January 8 was a new day. I still felt an incredible sadness as I relived so much of what took place 3 years prior, but I spent a good bit of time re-reading Jason's caringbridge site. As I sat and read with tears literally blinding my eye sight, I was once again blown away at the faithfulness of my God. I love so much that we kept a journal of the journey. The encouragement we received from that website was huge while J was being treated, but it amazes me that even now I find so much encouragement there. Although I am able to see His faithfulness to me then and know that He is never going to leave nor forsake me, I still find myself struggling in other ways right now. One of the major areas that Christ is having to work overtime with me is the area of contentment. One dictionary defines contentment as "desiring no more than one has; satisfied." A Christian author of the 1600s by the name of Jeremiah Burroughs defines contentmet as "a sweet, inward, quiet, gracious frame of spirit, which freely submits to and delights in God's wise and fatherly disposal in every condition." I have found lately that discontentment in my soul seems to be the theme. I have longed for the days prior to when leukemia invaded our lives. I have not only longed for pre-leukemia days, but also longed for this season of pain and grief to come to an end. Sort of 'enough already, God.' I have even cried that very prayer many, many times. I am currently going through a book entitled Disciplines of a Godly Woman by Barbara Hughes. Actually I was introduced to this book some time back by a sweet group of college girls who were studying through this book in a small group. I had the opportunity to lead one of their sessions. I now have the GREAT privilege to walk through this entire book with 3 recent college graduates who are wanting to be mentored each week. I can't wait to see how God uses this book not only in their lives, but in my life as well! Anyway, there is a chapter in this book entitled Discipline of Contentment. Discipline in any form is never easy and as I read through this particular chapter I became extremely convicted over my discontent with this season of my life. The author writes that Paul, when writing to the Philippian church, understood contentment so well. By the way, the book of Philippians happens to be one of my most favorite books of the Bible and chapter 4 my most favorite chapter. He tells the Philippian church in verse 11 that he had "learned" to be content in all circumstances. The word "learned" brings me great hope that I can be like Paul and LEARN to be content. Paul certainly faced numerous hardships and difficult circumstances. He goes on to say in Philippians 4:13, "I can do all this (i.e. find contentment) through Him who gives me strength." It will only be through His strength that I will be able to achieve this. As I thought about other seasons in my life, I began to realize that it hasn't been just this particular season that I have been hit with discontent. Does this sound familiar? When I was in high school, I couldn't wait to be in college. When I was in college, I couldn't wait to graduate, have a job and be married. When I first got married, I couldn't wait until we had a baby. When I had Anna Lea, I couldn't wait to stay home from work. When I got to stay home, I couldn't wait to have another baby. When Jason got accepted into CRNA school, I couldn't wait for him to graduate so we could move back to Hattiesburg. I could go on and on, but I think many can relate. We all long for whatever it is we don't have! My prayer right now for myself is that I can be content in the season God has called me. I don't want to miss anything that He wants to teach me nor do I want to miss the blessing of the right now. Another verse of scripture that I have come to claim each and everyday over the last several years is Psalm 46:10 "Be still and know that I am God..." Being still for me has always been difficult, but necessary! I know this God I serve is just that...GOD...and news flash...I am NOT! I certainly don't want to long for another season when that isn't what He has for me. Barbara Hughes said it best when she said, "the truth is, the worst thing that can happen to a Christian who is longing for something outside of God's will would be for God to grant that desire!" She goes on to say, "when we experience discontent, we must ask ourselves some pointed questions: What is the source of my longing? Is it a godly one-or ungodly? Will you yield to temptation in an attempt to satisfy your heart's desire, or will you turn to God and His Word for help?" OUCH! So...as I strive for contentment may Jesus fill my every longing! I know He is able! Philippians 4: 11-12 "...for I have learned to be content whatever the circumstances. I know what it is to be in need, and I know what it is to have plenty. I have learned the secret of being content in any and every situation, whether well fed or hungry, whether living in plenty or in want." May we all strive to be like Paul and learn to be content in whatever circumstances Christ allows! In the last few days I've felt led to share a little of what God has been doing in my life through my blog. Not that many even still check this site as I have not been a great or even good blogger over the last year or more. Even still I felt the need to write and this is my chosen outlet. Let me first start off by saying I am still incredibly thankful for God's grace in my life and in the life of the kids since Jason's death. When I look back at His faithfulness to me, I simply have to praise His name. I have no other choice. Over the last couple of months I have had many good days with rough days being the minority rather than majority. There are still many days filled with great sadness over the loss of sweet Jason, but so many of my days are filled with JOY as well. God's goodness...wow. I would be withholding the complete truth if I left it at that. About two months ago, I began to deal with fear again. Fear of the future. Fear of how I was going to raise these precious gifts God has given me without Jason. Fear of how I could possibly meet their many needs - their spiritual, emotional and even their short and long term financial needs. I assume the fear was brought on by the start of the new school year and all the demands that come with that. I could almost feel as if I was suffocating at certain moments during the day with the weight of it all. It was as if the enemy was trying to paralyze me. Just FYI...he didn't win, but he certainly didn't give up without a fight. If those specific fears weren't enough I then began to fear the obvious...what if something happened to me. What if the kids not only had their daddy on this earth, but what if God takes me from their life as well. I would be lying if I said this was the first time I have ever experienced this fear since Jason's death. This time it seemed to take hold of my every thought. When I was alone I would just sit and cry at the very thought of my sweet kids not having either parent on this earth. I was in total sin...in God's word we are commanded to cast out every vain imagination. I was not doing that. Nor was I taking every thought captive and making it obedient to Christ. Once again, I began to experience some minor health issues. Those issues only escalated those fears that there was something was really wrong with me thus I could be dying. My very close friends find it quite comical that I can convince myself I have some horrible disease and even though I laugh with them, it is in the quietness of my heart I am totally gripped with fear...too many "what ifs" flood my mind. I would also be hiding the complete truth if I told you I have only been like this since Jason's death. I was convinced while living in Naples that I was dying of a heart attack on a couple of occasions and if I were being really honest, I would have to admit that we confirmed my pregnancy with Jon Brent because I went to the ER with chest pain. Yes, I might should seek some professional help with all of this, but I get it honestly. My sweet granddaddy who lived well into his 80s before meeting Jesus also had to fight this same battle. :)I say all that to say, I do believe that because of Jason's death this stronghold in my life has intensified greatly. So...where is my faith in all of this? Glad you asked! You would think after seeing God's faithfulness the last 2 1/2 years that I wouldn't begin to doubt Him now?!? Make no mistake our enemy knows our weaknesses and is seeking to destroy us IF we allow him. One day last week while I was at work I received an email from my dad. He was simply passing along a caringbridge site of a lady about my age who is the mom to 5 beautiful little girls...she is fighting AML a relapse after a bone marrow transplant. I clicked on the link very reluctantly because I knew just from the little bit of information that he provided in his message that my heart would be broken when I began to read of her battle. I was right. I sat in my office for a few minutes after reading just a few journal entries and cried silently hoping no one would walk in to see the tears puddling on my desk. Thankfully I glanced at the time and realized it was time for me to make the mail run that I do daily at work. I was so very thankful that I could escape to my car and cry freely. I hurt so deeply for this family and as I thought of the pain they were enduring, I felt hopeless. This wasn't the only family I was hurting for as right now I am praying for so many who are having to walk down such dark roads right now. It was just at that moment this sweet mom to 5 who was battling AML pushed my emotions over the edge. I cried out to my Lord...please, come quickly and take all of this pain away from so many. Right there in the quietness of my car the Father whispered, Be Still and Know that I am God. And as God often does in my life, He used music to minister to my hurting heart. The silence became deafening so I turned on my radio. The very song on the radio was "My Help Comes From the Lord" by The Museum...how appropriate at that very moment of despair. All of the sudden the tears of great anguish turned back to tears of hopefulness and trust. Isn't our God so good like that!?! Through His word it was if He was shouting to me...Stephanie, I am doing a new thing in your life! Don't miss it by staying held captive by the anguish and pain you have experienced in the past. Don't miss it by fearing the new thing I want to do in your life! I don't believe this verse is saying to forget the pain as God has used that pain greatly, but rather for me not to dwell there. I can't wait to see all that God has in store for me as well as in the life of my kids. I am sure the enemy will try again to gain a foothold in my life. My prayer is that I would not allow him to hold me there rather to keep looking to the One who has been an ever present help in all of my times of need...He has been so incredibly faithful to meet my every need and then some. May I continually rest in His goodness and love for me. Two years ago today you left this fallen world for a place that I can really only dream and imagine. I have to admit to you that I have been somewhat jealous of the thought that you met Jesus before me! I know, I know…selfish of me to speak such. I have tried to imagine what it was like when you stepped into His presence. I have played out in my head you describing all that you saw and experienced over and over. Of course all of it is based on what I believe heaven will be like…I am confident it is so much more than I can even imagine. To say the words ‘I miss you’ doesn’t really describe what kind of void your departure on this earth left in me. I remember the night I left the hospital of your initial diagnosis of leukemia. I remember thinking in my mind, ‘what if God doesn’t heal Jason?’ What would life be like without you here? I would not let my mind go there that particular night, yet as we both went through the process of fighting the disease it was as if the Lord was preparing my heart that His healing might come in heaven and not on this earth. Even still I couldn’t grasp how life would be without you by my side. July 9, 2008, I arrived that morning to help you shower and dress for the day. Do you remember me meeting you in the hall of your parents entrance hall? Do you remember how we stood embracing each other for a few minutes? I remember hugging your frail and weak body so tightly and telling you how incredibly proud I was of you. I remember telling you how much I loved you and how incredibly thankful I was to be your wife. Jason, I had no idea that when I left there that day what would transpire just a few hours later. I assure you had I known, taking the kids swimming would have not been on my list of things to do that day. I have beat myself over and over for leaving you for the afternoon, but honestly I thought I was doing the right thing in spending some time with them as well. During those last few days of your life at FGH your family and mine clung to each other and to our Lord in a way that I really can’t describe. We hurt so much knowing that your hours on this earth were limited, yet, can I tell you that our Lord met us there in that hospital in a way I have never experienced before? Jason, you would have been amazed and totally overwhelmed at the love and support that was shown to our family in those last days. I kept thinking to myself…”I wish Jason could see how much he is loved.” Obviously there were moments of total brokenness over the fact that we knew your time on earth was coming to an end, but there were also moments of joy. Joy, you ask?  Yes, our brothers provided some entertainment and a little comic relief. Oh, and your dad confessed to you while you were unconscious that you were always his favorite! Brad was standing right there when he did it! I am certain that some of your former co-workers in the Intensive Care Unit thought were certifiably crazy! I know you aren’t surprised by that. And then July 12th came…a day of great beginnings for you yet a day that right now brings me such sadness. There are lots of things that happened that day that thankfully the Lord has helped me to forget, but there are also some things about that day that will forever be with me. I remember the kids coming to see you one last time. I remember how it was the last time the 5 of us were together. It was one of the saddest times of my life, but it was also a precious time as well. Later that day, I remember looking out the big window in your room on the 6th floor of FGH…by the way, they placed you in a room for the last hours of your life that had an incredible view! Sadly we never got that great view during your many inpatient stays while battling leukemia. Anyway, back to looking out the window…the sun was setting and the sky was breathtaking. As I held on to your hand, I remember looking out the window and thinking as the sun is setting in the sky so is the sun setting on our life together on this earth. I remember thinking how I wished I could stop it from setting, but I couldn’t. God had bigger and greater things in store for you. Your total and complete healing came a little before 11:00 p.m. that night. Oh, how my heart broke into a million pieces. I left pretty quickly after you took your last breath as all I wanted at that moment was for your lifeless body to have life again, but I knew that couldn’t happen so the next thing I wanted was our sweet children. I know, I shouldn’t have woken them, but as was the case so many times in our life together, I was totally dictated at that moment by emotion! Speaking of the kids…can I just tell you how awesome they are? Honestly, I don’t know how privy you are as to the ongoings on this earth now that your residence is with the King, so let me just tell you our kids are doing amazingly well. 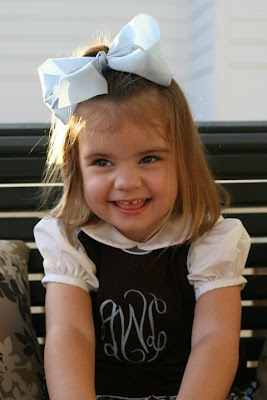 Sweet Anna Lea is just that... so sweet and precious. Her love for you continues to grow even in your absence from her daily life. She relives so many of the special times the 2 of you had together…I love hearing her recall each and every memory. It always makes my heart smile even though often tears fall all at the same time. She misses you a lot. Daily she speaks of you. She asks lots of questions about heaven and what you are doing. I don’t pretend to know all the answers, but we have read a great book together about Heaven. You should read it! Ha! Anyway, the best thing about Anna Lea since your passing is that her faith in our Lord is growing by leaps and bounds. She loves the Lord much...I do want to believe that you are already aware of this! Jon Brent is one fun little kid and as he did while you were on this earth he continues to bring much JOY to our family. I do have a bone to pick with you about him, though. He is somewhat (ha) OCD about certain things…you know he didn’t get that from me! God has used him to bring laughter on many a day where the pain was just too much. He still looks so much like you that sometimes it takes my breath away. He is so literal with everything. Oh, and he is quite the little dancer. Not sure where he got that, but I have a strong inclination that it came from my neighbor, who happens to be your brother! Oh! I almost forgot…I bought a house right next door to a house that Brad and Sherri bought! We have all thought many times how you would have loved that. Not forgetting your Ally girl…she is something else. I laugh often and tell people that you would have been puzzled by her. She doesn’t quite fit the mold of the other two. She marches to a different beat altogether, but continues to make us all smile…and scratch our heads. She recognizes you in all the pictures plastered all over our home. Of course right now she thinks you are at the beach in heaven with Jesus.  Anna Lea makes a point daily to talk of you to Ally. She has made it a priority to make sure she knows what her daddy was like. She also looks a lot like you and for that I am most thankful. So much has happened since your departure…birthdays,new house, Anna Lea and Sherri baptism, first days of school, birth of a sweet new nephew, anniversaries, me returning to work, Christmas, trips to Disney, trips to the beach, family gatherings, etc. Many of those special events/days have been incredibly tough because you weren’t here with us, but I can definitely say that our God has been SO incredibly faithful to all of us. He has provided for our every need. He has carried us when I thought there is no possible way we can go on. He has been so good to us and honestly I don’t deserve any of it. I would be lying if I didn’t admit that I have wished things could have been different and that God would have chosen to heal you here rather there, but that is just me speaking from my flesh. God was glorified in your death. Even some came to know Him personally because of it. Others returned to Him because of it. For those reasons your death was not in vain. I pray daily that He would continue to receive the all the glory and that He would continue to use our story in pointing others to Jesus. I wish I could tell you that I have been a perfect mom to the kids and great manager of our finances…I know the thought of me managing the checkbook must make you roll your eyes!  I have failed at lots of things since your passing, but as you know His grace is always enough and covers me daily. Please don’t be upset that I don’t keep receipts or write down every expense in the check register… I promise I am doing the best I can! Haha! There have been many days where I have just layed in bed praying that it all had been a really bad nightmare and that I am going to wake up to find that none of it happened, yet I quickly discover my true reality. It is those moments that I say aloud…’God, you are sovereign and I trust you.’ His peace is like no other. I continue to be amazed at our God through all of this. You know I have always loved worship, but since your death I love it even more because when I participate in it I am getting to do the same thing you are doing in heaven! That thought blows my mind. Jason, I love you so and still so proud that I had the opportunity to be your wife and the mother of your children. I will never get over that blessing. I so look forward to the day where we will all be reunited again. Until then…I’ll keep praising Jesus here while you praise Him there. November 12th, Jason would have turned 35. I miss him so much that sometimes I have to remind myself to breathe. Although the pain is not as sharp as it once was, it is still there. It is with me everywhere I go. When I wake up, when I go to sleep, when I go to work, when I come home from work, when with the kids, when without the kids...it's always there. I guess it always will be. The grace of our Lord continues to amaze me. It is His grace that gets me through each day...He even provides moments of joy. It's so hard to understand how I can experience joy, yet at the same time feel such sadness over not having Jason in my life. The only way I can attempt to wrap my head around it is to say...BUT God! He continues to supply my every need and then some. I hate so badly that we can't celebrate Jason's birthday with him today or ever again on this earth. Yet, it is the HOPE of heaven that our Lord gives us that gives me the assurance that one day we will celebrate with him again. To this promise I cling tightly. I am so proud of our children that the Lord blessed us with. As much as they tire and wear me down each day, I certainly can't imagine going through this thing called life without them. All 3 of them are doing so well considering they are missing their daddy in their life. Anna Lea speaks daily of him and I am so thankful she does. She is so precious. Jason would be so proud of how well she has handled all of this. She came downstairs last week after the others had already gone to sleep. I was sitting in the den when she asked, “mom, are you angry that daddy died?” Without hesitation I said, “no, Anna Lea, just very sad.” Immediately I asked her the same question. Without any delay she replied, “no, just sad, too, but I am also very happy that he is happy in heaven.” Wow. My prayers are being answered. You see, I can honestly say that I have never been angry with God over his choosing to take Jason home at 33. I have certainly questioned his ways, but I have chosen to trust His sovereignty. I have prayed over and over that my children would always do the same...with this situation as well as any other hard lessons life throws their way. To hear my sweet daughter say she was happy that her daddy was happy in heaven brought me such joy and comfort. She is learning to trust our Lord at such an early age and for that I am so very thankful. Jon Brent looks the most like Jason and has so many of his characteristics. Sometimes when he smiles it literally takes my breath away because I can see Jason's smile all over his little face. It totally amazes me how many ways Jon Brent is like his daddy. The way he likes his things just so defined Jason to a tee. Daily my parents and I laugh aloud at something Jon Brent does and then we look at each other and say, “that is Jason.” His memories of his daddy are few, but I am praying daily that somehow, someway he'll remember more than most can remember at his young age. The other day I was putting on make-up in my bathroom when Jon Brent started shouting, “mom, come here, come here!” I went to see what he was needing and discovered a large smile on his face with his finger pointing to the tv. There was a music video that Jason used to play for he and Anna Lea from Nick Jr.'s website. The exact video was being played on tv at that moment. He remembered Jason playing it on the computer for them and how they would all dance around while it played. Jason would do this with the kids almost daily when we lived in Naples. Oh, how I was so sad for Jon Brent at this very moment, but at the same time so excited that he remembered this special time on his own. And then there is sweet Ally. I have written before how I hurt for her in such a different way than the other two. She is full of life and certainly has a mind of her own! She is the most independent one of the three. She would have made Jason laugh...a lot. Her little personality would have really intrigued him. I am certain there would have been moments of him scratching his head over little Ally, but she would have also had him totally wrapped around her finger. Right now her life is happy and full. She doesn't know the sadness we experience on daily basis. She doesn't remember the months Jason was sick or what life was like shortly after his death. All she knows is that she is loved by all that surround her and for the most part all of her wants are met! (mainly by Nana! :) She knows only of the word 'daddy' because Anna Lea saw to it several months ago that she learn who he was from pictures that are placed all over our house. Sadly she really doesn't know him. She will only know of him. She will only know the things about him that we tell her. I am convinced that she will grow to love who he was, but I hate more than I can express that she will never experience his love on this earth. On January 7, 2008, my life as I knew it changed forever. 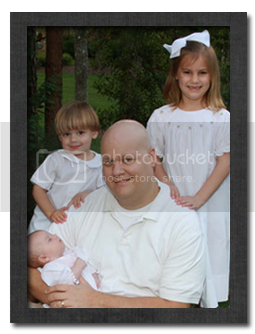 My sweet husband, Jason, was diagnosed that day with Acute Myeloid Leukemia. He fought this dreaded disease for 6 months. We prayed fervently for complete healing and on July 12, 2008, Jason experienced COMPLETE healing by entering eternity with Jesus. He left behind 3 precious children, Anna Lea, Jon Brent and Ally. Although, this is most definitely not the life I had dreamed or hoped for, I am leaning on His everlasting arms knowing that He will work all things for good.